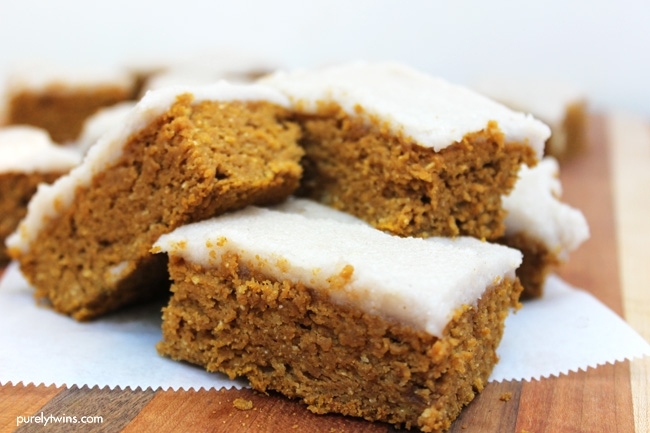 A healthy recipe for gluten-free protein pumpkin bars with a no sugar dairy-free coconut butter frosting. Pumpkin bars that are made in 20 minutes. Perfect to enjoy this holiday season. Place pumpkin puree, eggs, and pumpkin seed butter in a bowl and mix together. Add in coconut sugar, spices, baking soda, and flours into bowl. Add in coconut oil. Stir until blended. Grease a 8 in x 8 in square pan with coconut oil. Spread pumpkin bar batter into ban. Combine coconut butter, coconut milk and stevia into a bowl. Add more coconut milk if needed.